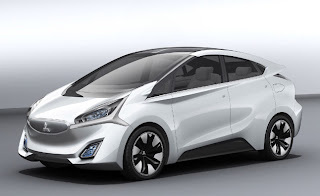 Mitsubishi has recently pulled the wraps off one of its latest creations, the CA-MiEV Concept, ahead of the model’s official debut scheduled for the 2013 Geneva Motor Show. According to the car manufacturer, the Mitsubishi CA-MiEV Concept is previewing a production version which will be the successor of the current i-MiEV. The Mitsubishi CA-MiEV is an all-electric vehicle with a 300 km range, which has a totally different design and, most importantly, looks significantly bigger than the current i-MiEV. While full details aren’t yet available, Mitsubishi says the CA-MiEV will incorporates next-generation EV technologies under development at the company, such as high-energy density batteries and high-efficiency EV systems including motor, inverter, regenerative braking and wireless charging system. With Mitsubishi as one of the major partners in the SIM Drive consortium we are left to speculate if the CA-MiEV's 300 km range has been achieved by incorporating the in-wheel motor system from the SIM-LEI and SIM-WIL demonstrator vehicles.